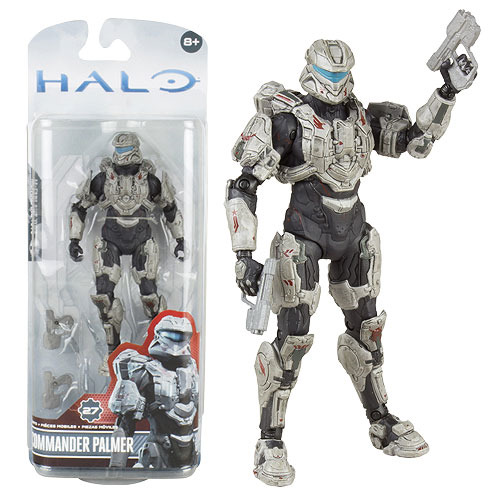 The Halo 4 Series 3 Commander Palmer Action Figure features cool weapons, and accessories from the Halo 4 video game. Commander Palmer is a highly detailed figure that stands approximately 6-inches tall and includes about 25 points of articulation. The commander of the Spartans aboard the UNSC Infinity, Commander Palmer is released with her trademark Spartan Armor in Steel/Red colors. This key authority figure is instantly recognizable from the Halo 4 Campaign and multiplayer Spartan Ops. The deadly leader comes equipped with two Magnum Pistols, her weapons of choice. Ages 8 and up.